Take a small step to bring smiles to the faces of the less fortunate. 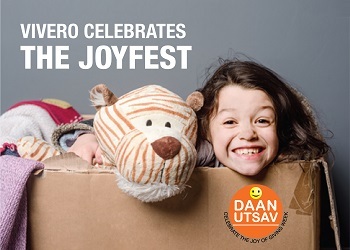 Contribute toys, stationary, clothes , dry ration or toys for a noble cause. These will be distributed at Goonj, an NGO that addresses crucial gaps in rural infrastructure, water, environment, education, health, disaster relief and rehabilitation. Because it is rightly said “Joy of living’ is in “Joy of giving”.